News of the mass shooting Sunday night in Las Vegas, Nevada, had people taking to social media to voice their shock, concerns and prayers for the victims and their families. 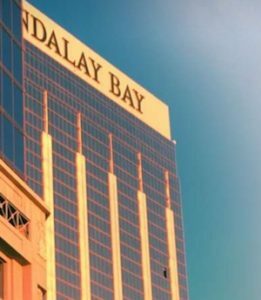 From a window on the 32nd floor of the Mandalay Bay Hotel, Stephen Paddock unleashed a reign of terror that is taking its toll on the country. At least 58 people were killed and hundreds more were injured. It would be hours, and in some cases days, before the families of some of the victims would know what had become of loved ones at the hotel to enjoy a country music festival. With all the stories of heroism, sadness and devastation making headlines, Granada Hills resident Kenny Haack is thankful to be alive. Haack, 43, was in Las Vegas Sunday with his girlfriend to celebrate his birthday. The couple was about to kick off the night’s festivities when they were told by MGM hotel security to stay in their room. According to Haack, what happened next will forever change his life. He says he turned on the room’s television set, and that’s when he got the first glimpse of the horror unfolding just a short distance from his hotel. People at the music festival were running for their lives, Haack told EGP Tuesday morning, still shaken up despite not having been at the festival. While Haack was one of the fortunate people in Las Vegas that night to escape death or injury, he, like millions of other people across the country, is not without scars. All across the country, on social media, in hushed conversations at coffee houses, in living rooms, kitchens and classrooms, people are trying to make sense of the tragedy, to get a grip on what would cause someone to open fire on thousands of people gathered to enjoy some good music with family and friends. They may never know. The gunman, 64-year-old Stephen Paddock of Mesquite, Nevada killed himself that night, leaving too many questions unanswered. Crisis response experts from Los Angeles were at the disposal of San Bernardino County authorities Thursday, as investigators examined whether international terrorism was a factor in a massacre committed by a couple who later died in a gun battle with law enforcement officers. The shooting Wednesday inside a San Bernardino treatment center for people with developmental disabilities – and the subsequent gun battle – shocked the nation and left similar facilities and law enforcement across the Southland on edge. President Barack Obama called it part of a pattern of mass shootings with “no parallel anywhere else in the world,” and this morning he ordered that flags be flown at half-staff at all U.S. federal facilities in the United States and abroad and on all U.S. Navy ships. Federal officials from Los Angeles and elsewhere in the nation worked Thursday to uncover the motive for the attack and determine if there was an international terrorism component or if it should be regarded strictly as workplace violence. The Los Angeles Police Department, which was already on a heightened state of alert due to the recent Paris terror attacks, did not immediately mobilize following Wednesday;s 11 a.m. shooting in the Inland Regional Center, where 14 people were killed and 21 were wounded. But the LAPD briefly went on a modified tactical alert in response to the violence. The alert enabled the department to extend officers’ shifts, according to Officer Aareon Jefferson. Under a full tactical alert, only priority calls would be answered. The modified tactical alert was lifted shortly after 5:30 p.m. Wednesday, when the two suspects in the shooting were confirmed to be dead. Authorities identified them as Syed Rizwan Farook, 28, and Tashfeen Malik, 27, who were married two years and had a 6-month-old daughter. Farook was born in the United States of Pakistani parents and was reported to be a five-year employee of the San Bernardino County public health agency, which was holding a holiday party during which the shooting erupted. The Los Angeles Times reported that Farook had traveled to Saudi Arabia last year and returned with a new wife he met online. At a news conference this morning, David Bowdich of the FBI said Malik came to the United States with Farook in July 2014 on a work visa and had a Pakistani passport. The couple married after arriving in the U.S.
Bowdich said it would be “irresponsible” to describe the crime as terrorism until more is known. San Bernardino police Chief Jarrod Burguan, also at the news conference this morning, said it was not known if any of the victims was specifically targeted by the couple. “They sprayed the room with bullets,” Burguan said. He noted that Farook had been at the party earlier but left, possibly after having some type of dispute. Burguan said the preliminary investigation determined that the suspects fired 65 to 75 rounds in the room. The couple wore black clothing and combat-style vests, but were not wearing body armor as had been earlier thought. A candlelight vigil will be held at 6 p.m. at San Manuel Stadium, 280 S. E St., San Bernardino. Burguan said the community is tight-knit and resilient. “We will survive this,” Burguan said. “We had no idea something (like) this could happen,” Khan said at an Anaheim news conference organized by the Council on American-Islamic Relations (CAIR-LA). Apparently fearing an anti-Muslim backlash, CAIR-LA’s Executive Director, Hussam Ayloush, issued a statement on behalf of the group and the Islamic Shura Council of Southern California. In a precautionary move, the Harbor Regional Center in Torrance closed for the rest of the day Wednesday following the shootings, as did the North Los Angeles County Regional Center, and the Eastern Los Angeles Regional Center. All of them reopened today. “Our police and fire agencies are in contact with their counterparts in San Bernardino and are on standby to assist as needed,” said Los Angeles Mayor Eric Garcetti. In a news briefing on Wednesday, Burguan said the attack reflected planning. Police and witnesses said the assailants walked into the holiday party in a conference room and started shooting. According to Burguan, the investigation led police to a home in Redlands, and as officers approached, Farook and Malik fled in a dark SUV. A pursuit ensued, ending back in San Bernardino, where a gun battle ensued. Farook and Malik were killed in the prolonged shootout, Burguan said. He said both suspects were armed with assault rifles and handguns. At this morning’s briefing, Burguan said a San Bernardino police officer suffered a leg wound that was not believed life-threatening, and a San Bernardino County sheriff’s deputy suffered leg cuts, possibly from shrapnel. The suspects fired about 75 rounds during the gun battle, and about two dozen law enforcement officers fired about 380 rounds, Burguan said. The suspects had about 1,600 rounds of ammunition on them or in their vehicle, Burguan said. Agents from the Los Angeles field office of the Bureau of Alcohol, Tobacco, Firearms and Explosives were sent to the scene of the morning shooting, along with personnel from the FBI. Agents from Homeland Security Investigations also responded to the shooting. The Inland Regional Center has nearly 670 staff members and provides services to more than 30,200 people with developmental disabilities and their families in San Bernardino and Riverside counties. As the shooting investigation unfolded, the Los Angeles County Sheriff’s Department issued a reminder that people can take steps to try to protect themselves in an active-shooter situation. The department has a website and video available with tips at activeshooter.lasd.org.